Hello, first let me introduce myself. My name is Jewel and I am a 33 year-old woman currently living in North Carolina. 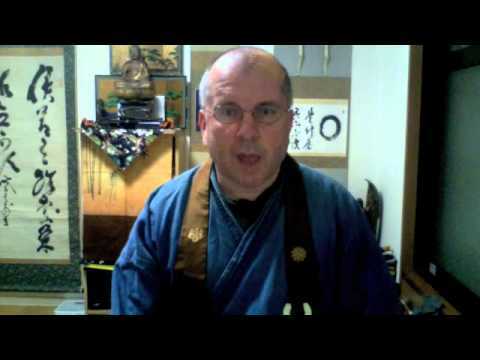 While I am quite new to formal zazen practice, I have been studying and practicing Zen for fifteen years on my own. I do not currently have a teacher, though I hope to find one soon. In the meantime, I am under the tutelage of a man I'll call Bob, who was once offered the position of Zen Teacher, but turned it down, feeling he wasn't ready for its responsibilities. So, here I am studying zazen with a man who knows his stufff, but doesn't have the title (what's a title anyway?). Like I said, I've been studying Zen for 15 years now on my own, and I am at a point in my life when I feel I want to become a monastic. You may be thinking, "She doesn't have formal training under a Zen teacher..." and you'd be right. But I feel I really would fit in in a residential setting. Also, I am concerned that the monastery will look at my disability and say that they cannot support me as a monk. You see, I am almost totally blind. I have been blind for ten years this year, so I'm not new to the ways of being blind, but I'm worried that the monastery will refuse my application on the grounds that it would require accommodations that they don't feel they are able to provide. Namely, I would need Braille or audio books and documents and be shown around places that I am new to to get the "feel" for it before I get started at the location. I don't need a babysitter or aide; I can take care of myself. However, I would need things like a screenreader-enabled computer (which I could provide or just provide the screenreader for) and the other two things I said. I feel like they would reject me without considering what it would actually be like, maybe they'd see me as a burden that cannot be accommodated...I have my doubts about the possibility of being a monastic, though I don't doubt my abilities to be indepenedent. What are your thoughts on all this and what can I do to ensure that I am given just as much of an opportunity to show myself ready for the monastic life as anyone else? Welcome. Treeleaf might be of interest. Treeleaf Sangha is a multicultural Zen Buddhist Community in which people of all socio-economic classes, nationalities, races, ages, creeds, genders, sexual orientation and identification, and physical abilities discover shared humanity by direct experience of one anothers’ lives. We are open to all. We commit ourselves to cultivating a practice in diversity and multiculturalism by incorporating into our practice the dissolving of all barriers that perpetuate the suffering of separation, prejudice, and discrimination. We intend to expand and develop our awareness of the ways we are conditioned to separate ourselves by socioeconomic class, nationality, race, age, creed, gender, sexual orientation, physical ability and other forms of identity. Could I ask - how then are you coping with reading and writing on this forum? The Chinese Monk who brought Buddhism to Japan, was blind, by the way, so it's not going to hold you back, unless you communicate that it's s handicap for you. jewel,looking foward to your zen contribution.and welcome. @Lobster Thank you for that link and explanation of Tree Leaf. I think I will give it a go. @federica This site is actually really accessible to screenreader-users. I'm having no difficulty reading and writing on this forum using my screenreader (it reads whatever is on the screen) and touch-typing, which I developed at an early age due to being at an elemenetary school that recognized the future of computers and started teaching touch-typing and computer use in 2nd grade. I don't see my blindness as a handicap. In some ways, it's beneficial to be blind. Bob says that it makes it easier to create a monastery of the mind, the proper mindset for zazen, and allows you to be less distracted by things like other peopee's actions and comparing yourself to them, as well as visual stimulation that may or may not be of any help to oneself. That's cool that the Chinese monk that brought Zen to Japan was blind. Do you know his name? I'd like to read up on his life. I'm very pleased reading the site poses no difficulty to you. I don't see my blindness as a handicap. In some ways, it's beneficial to be blind. Bob says that it makes it easier to create a monastery of the mind, the proper mindset for zazen, and allows you to be less distracted by things like other people's actions and comparing yourself to them, as well as visual stimulation that may or may not be of any help to oneself. Yes, well put. While it may well be considered a blessing to have all 5 senses functioning, it's true that they may prove a distraction, or lead us to complacency, taking such gifts, if you will, for granted. I personally have a hearing problem, coupled with chronic tinnitus, so am aware of the challenges of a particular sense...'misbehaving'...! Thank you for the great comments. I'm really energetic and passionate about zazen and life in general and hope that energy and passion never goes away. One doesn't need to have had any sort of "formal" teaching to have an interest in practicing, whether in a monastic setting or otherwise. The desire itself is enough to explore the possibility. Practice and study with anyone you feel you can benefit from, even if it's a temporary relationship. The insights you gain will go with you wherever you go. Questions about acceptance to any sort of residential program should be directed towards the places you're interested in. By explaining your interest and specific situation, they can give you a better idea of what's open to you than anyone here. Whatever happens, always remember that you're not limited by your blindness so much as others may feel limited in their ability to accept you and give you the guidance you need. Questions about acceptance to any sort of residential program should be directed towards the places you're interested in. Exactly. Make contact. Ask for advice. Sit outside the gate, so to speak. Becoming a zen monastic is like the dharma, utterly useless. Tee Hee. Good luck nun-the-less. @jewel -- Welcome. Hope you find something useful here. Sometimes I think of monasticism as one of the corner-office versions of Zen practice ... everyone thinks that becoming a monk would be a mark of attainment... you know, the old corporate ladder version of life: If you're a monk or nun, you're better off than if you were just plain old Sally Student. Looking back, all I can say is, go ahead, knock yourself out ... and then get to work. Do you consider how it is that you could possibly know that some other person ... "knows his stufff." Hell, Donald Trump "knows his stuff" and if you don't believe me, just ask him. My mother once said, "Don't get too holy by next Thursday." It's good to have a little discipline in life, to reflect, and to make some room for a wider arena. But how could you be any more "here and now" than you already are ... here and now? Can the Buddha be more Buddha than the Buddha? The word "Buddha" means "awake." It does not mean some creation with a halo and wings and oozing an imagined goodness. Take your time. Make a promise, keep a promise. It is important to keep the promises you make. If you promise to sit tomorrow morning at 6 a.m., then do it. If, in the meantime, the pipes burst and you have to call the plumber, keep your promise and focus on " I CHOOSE not to sit." Don't pin the tail on someone else's donkey. Your life is your life. It is not a "Buddhist" life. It's just your life and it deserves respect as it is, not as it somehow ought to be. I got into a monk-warp in the past, went to a monastery, and took a couple of months to recognize I wasn't monk material. Oh, I was so embarrassed. But it was one of the best experiences I ever had ... flunking out of a monastery. Don't worry: Zen won't let you down any more than it will raise you up ... with or without the uniform. Your life is your life and it is important to treat it that way. Sure, Buddhism is a bit squirrely and everyone would like reassurance that they aren't as nuts as they may fear they are. Well, the only way to know that Zen or anything else is worth the price of admission is ... give it a go. Patience, courage and doubt are your allies. Take it easy and keep it firm. @genkaku Oh my goodness, that is so insightful! Your words are an inspiration to me, and I will do what you suggest and take it easy. I'm just starting out in formal zazen training, so this is a long, "infinity-shaped" path for me. I say infinity-shaped because it's an endless journey, and I'm recognizing that it's not a path from point A to point B. I don't think being a monk would make me more Buddha-like or anything. I just think the structure would be good for me, that the daily schedule and the changes it brings will be good forme. I'm going to an "Introduction to Zen" three-day retreat at the ZMM in May, hopefully, and will explore the process of becoming a formal student there, travel time and all. They have a rideshare board, so I'm hoping to find someone who a) goes to ZMM pretty regularly and b) wants a passenger. I plan to call and talk to ZMM tomorrow about my personal situation and see what they think. AS someone said, stand outside the gates, so to speak, make myself known to them. I really think this forum will be a big help to my practice. I'm finding insight and awesomeness everywhere I look already. So, I called the ZMM today to talk to them about my accommodation needs and desire to come for an Introduction to Zen weekened. They said they would definitely be able to work with me and that the accommodations don't seem to be anything that can't be worked with. I'm really excited now, because I feel this is the right path for me and that I can be of great service to others through practice and studying. I really look forward to the weekend, which I'll be going at the beginning of May, but I'm really trying to stay present in the moment, too. I'm keeping up with my 4:30 AM zazen and kenhen (sp?) and also am finding myself being very mindful when I'm "out in the world." I have also contacted someone about volunteering at a nearby homeless shelter as a mentor and/or childcare provider, and hope that that can teach me how to be of more help to others and teach me generosity and responsibility. I saw my therapist today and we had to change my therapeutic goals because I've mostly bypassed the ones I made before just in the last two weeks and my therapist says she's exteremely pleased with the work I've done and the practice I'm doing to "get my money worth," as she puts it. So I just thought I'd update everyone on my situation and thank you all again for your comments!